Prostanthera cryptandroides is a small shrub reaching a height one metre. Young growth is sticky. Mature leaves are elliptical leaves to ovate, about one centimetre long and very aromatic. Flowers are 1.5 centimetre long, white to lilac with purple-spotted throat. Flowering is conspicious and profuse between September and April. Tip pruning is necessary to maintain foliage density and abundant blooming. P. cryptandroides is an attractive small shrub to use in native cottage gardens and rockeries. There are two subspecies: P. cryptandroides ssp. cryptandroides and P. cryptandroides ssp. euphrasioides. The former has limited distribution and is found in the Central Tablelands and Central West Slopes of NSW. The subspecies is considered to be vulnerable and is protected in Wollemi National Park and Gardens of Stone National Park. The latter subspecies has much wider distribution and is found from north Queensland to northern NSW. The main visible difference between subspecies is the lack of glands on the calyx and branches of P. cryptandroides ssp. cryptandroides. The species name means similar to the genus Cryptandra. 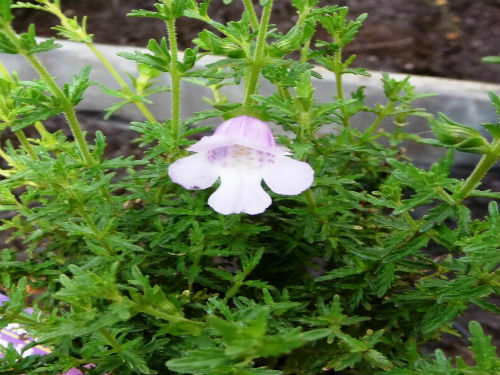 The subspecies name means similar to the genus Euphrasia commonly known as Eyebrights. Propagation from cuttings usually presents no problems.